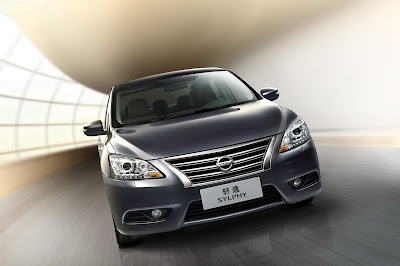 The all-new 2013 Nissan Sentra continues the brand's product onslaught as the third of five all-new vehicles being introduced in a 15-month period. Like the recently unveiled Nissan Altima and Pathfinder, the redesign of Nissan Sentra focuses on class-above design standards inside and out, as well as efficiency in engineering. The new Sentra is 150 pounds - or five percent - lighter than the outgoing model, yet has slightly larger overall dimensions and more interior room. The lighter and more aerodynamic new Sentra allows Nissan to use a more fuel-efficient 1.8-liter engine, which along with the next generation Xtronic CVT® with sub-planetary gear helps deliver a 13 percent improvement in EPA combined fuel economy. With the FE+ models, Nissan Sentra achieves up to 40 mpg on the highway. Other CVT-equipped models are rated at 39 mpg on the highway. All CVT models achieve a best-in-class EPA rated 34 mpg combined (City and Highway). "The 2013 Nissan Sentra is the most revolutionary design in the nameplate's 30-year history, a worthy addition to what is without question the most innovative, highest quality, highest value sedan lineup in Nissan history," said Al Castignetti, vice president and general manager, Nissan Division, Nissan North America, Inc. "With the complete redesign for 2013, Sentra is closer in look and feel to Altima than a typical compact sedan. Like Altima, the new Sentra offers best-in-segment attributes, such as high fuel economy and easy-to-use connectivity, that offer real customer value and convenience." 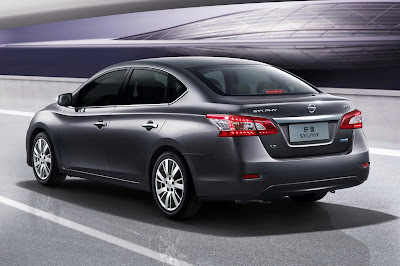 The new Nissan Sentra has a strong family resemblance to the recently introduced 2013 Nissan Altima, both in exterior and interior styling cues and its "class-above style" against competitive vehicles in the compact sedan segment. Nissan Sentra's all-new design is elegant, modern and refined, reflecting a "professional" character targeted at upwardly bound buyers who aspire to drive something more premium than some of the other designs in the segment. It adopts Nissan's bold new signature trapezoid-shaped grille and large wraparound headlights with LED accents - the only sedan in the compact segment to offer them as standard equipment. In the rear, LED taillights are also standard, which complements the sophisticated styling. Compared to the previous design, Nissan Sentra's beltline has been lowered and a new character line has been added that runs from the front fenders, along the sides, and finishes at the sculpted taillights and trunklid, giving the new Sentra a more aggressive stance and enhanced outward visibility for passengers. Other exterior features include chrome door handles and accents, available heated outside mirrors with integrated turn signals, and available sport front and rear fascias and rear spoiler. 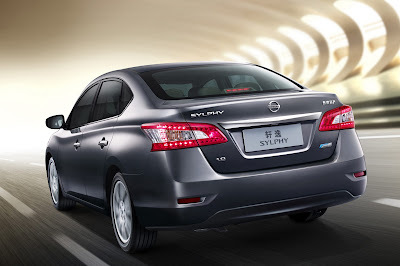 The 2013 Sentra is built on a new platform that is lighter than the previous design, contributing to the new model's more than 150-pound weight reduction. It also helps Nissan Sentra provide one of the largest interior volumes in class, along with ample rear seat legroom and enhanced trunk capacity. Compared with the previous generation Nissan Sentra, the 2013 model offers a 0.6-inch longer wheelbase (106.3 inches) and a 2.3-inch longer overall length (182.1 inches). The front overhang is shorter and the rear overhang extended. It is slightly lower in height (-0.6 inches) and narrower in width (-1.2 inches) for enhanced aerodynamics, yet offers nearly identical total interior volume (111.0 cubic feet versus the previous 110.8). The coefficient of drag has been significantly reduced to 0.29 from the previous 0.34. "Sentra has long been known as one of the roomiest sedans in class and the latest iteration is no exception. The fine-tuning of its dimensions has created not only extremely well-balanced exterior proportions but enhanced rear seat legroom and created a larger, more usable trunk space," said Castignetti. Nissan Sentra's sophisticated new look continues inside with a high-quality interior design with materials not usually found in compact vehicles, including soft-touch instrument panel and driver's door armrest, available leather-appointed seating and available Maple wood-tone trim. Along with offering mid-size roominess in a compact-size exterior, the intuitive interior layout emphasizes driver control and class-leading seat comfort for all occupants. The instrument panel curves out towards the doors and features Fine Vision electroluminescent gauges that are backlit even in daylight, providing a high-quality look that is also easy to read. Rear seat legroom of 37.4 inches is among the largest in class and immediately apparent to occupants, even with the front seats in the rear-most position. The rear seat is a standard 60/40 split folding design, offering versatile access to the 15.1 cubic feet of trunk space (2.0 cubic feet larger than the 2012 Sentra trunk). Standard interior features include 6-way manual driver's seat, 4-way manual front passenger's seat, front and rear door pockets, front center console with padded armrest and cupholders, rear seat armrest with cupholders, air conditioning with in-cabin microfilter, tilt and telescopic steering column, power windows with driver's one-touch auto up/down with auto reverse, power door locks with auto-locking feature, two auxiliary 12-volt power outlets, remote keyless entry and remote trunk and fuel-filler door releases. A new Dual Zone Automatic Temperature Control (ATC) system is offered for the first time with Nissan Sentra, allowing the driver or front passengers to set their own individual temperature settings. The standard audio system is an AM/FM/CD system with four speakers. Other available systems include a 6-speaker AM/FM/CD system with 4.3-inch color display, USB connection for iPod® and other compatible devices; and a Bose® Premium audio system with eight speakers and an amplifier that has been specially tuned to either the cloth or leather interior for best performance. Also available is SiriusXM Satellite Radio (SiriusXM subscription required, sold separately) and Bluetooth® Hands-free Phone System. "Nowhere is the new Sentra's 'class-above' style more evident than in the interior. You notice it the minute you sit in the roomy, comfortable seats and when you touch the high quality materials. And when driving you notice the extra attention paid to isolating noise, vibration and harshness from entering the cabin," said Castignetti. "And that's before you even get into the various advanced technology features that you usually don't expect in a compact sedan segment vehicle." 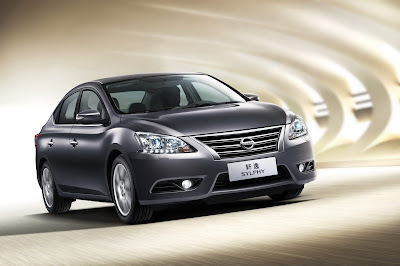 Like the new Altima, the 2013 Nissan Sentra offers a major step forward in technology that helps owners stay connected. An all-new version of the Nissan Navigation system is available. NissanConnect with Navigation includes a Hands-Free Text Messaging Assistant that reads incoming text messages and allows drivers to reply without taking their hands off of the steering wheel. The system also offers Pandora® radio capability, Streaming Audio via Bluetooth® and a large 5.8-inch touch-screen display. The Navigation System includes NavTraffic and NavWeather functions (SiriusXM subscription required, sold separately), along with POIs powered by Google™ and Google™ Send-to-Car functions. The Navigation's map views now features warnings for curves and speed limit information. Other available technology ranges from the RearView Monitor and Nissan Intelligent Key® with illuminated push-button ignition switch to the Tire Pressure Monitoring System (TPMS) with Easy Fill Tire Alert feature. If air is being added or removed from a tire, the system signals the user when the recommended tire pressure has been reached by sounding the horn. As expected from a ground-up redesign, the new Nissan Sentra features an all-new engine and CVT transmission. Now displacing 1.8-liters, Sentra's advanced DOHC 4-cylinder engine offers a longer stroke than typical engines in its class, resulting in improved combustion speed and efficiency. The engine is equipped with a twin Continuously Variable Timing Control (CVTC) system which modulates both the intake and exhaust valve opening time (similar to that used on the flagship Nissan Maxima). The engine's internal friction has been reduced, improving efficiency. The DLC creates about half the friction of previous coatings. In addition, the valve springs are shaped similar to a beehive, with a smaller diameter towards the top - reducing inertia weight, improving valvetrain efficiency and smoothing engine operation. The engine is rated at 130 horsepower and 128 lb-ft of torque. The new engine is matched with a new-generation Xtronic CVT® (a 6-speed manual is available in the base Sentra S model). The new CVT features a host of enhancements (versus the previous CVT) that contribute to an improvement in fuel efficiency and lower vehicle weight. It also offers a wider gear ratio of 7.3:1 through use of a sub-planetary gear and smaller pulleys, resulting in high-speed fuel efficiency at low rpm and responsive acceleration. Fuel economy is rated at 30 miles per gallon City, 39 miles per gallon Highway and a class-leading 34 miles per gallon combined with the CVT. "In the race for fuel economy bragging rights sometimes what gets lost in the mix is drivability. Nissan Sentra's new engine and advanced CVT design are perfectly matched to provide the best of both mpg and driving enjoyment - smooth, quiet and efficient operation around town or highway cruising, responsive acceleration and excellent mpg and driving range," said Castignetti. The new Nissan Sentra also features an independent strut front suspension with stabilizer bar, torsion beam rear axle with integrated stabilizer bar, power-assisted vented front disc/rear drum braking system (4-wheel disc brakes are available), and vehicle-speed-sensitive electric power steering. Available wheels and tires include 16-inch steel wheels with full covers with 205/55R16 size all-season tires or 17-inch aluminum-alloy wheels with 205/50R17 all-season tires. In addition to the Nissan Sentra S model's long list of standard features, Sentra SV models add cruise control, two additional speakers, illuminated steering wheel audio controls, vehicle security system and premium cloth seating and door trim. The Nissan Sentra SR adds a sportier appearance, starting with 17-inch forked 5-spoke aluminum-alloy wheels, sport front and rear fascias, sport front grille, lower body side sill extensions, rear spoiler with integrated LED brake light, fog lights and chrome exhaust tip finisher. Inside, the Sentra SR includes sport silver interior trim, premium sport cloth seats and driver's seatback pocket. The top-of-the-line Nissan Sentra SL adds 17-inch split 7-spoke aluminum-alloy wheels, Smart Auto headlights, fog lights, heated outside mirrors with integrated LED turn signals, Nissan Intelligent Key®, Bluetooth® Hands-free Phone System, 6-speaker audio system with 4.3-inch display, and Sirius XM Satellite Radio (SiriusXM subscription required, sold separately). Additional Sentra SL equipment includes leather-wrapped steering wheel and shift lever knob, Maple wood-tone trim, Dual Zone Automatic Temperature Control (ATC), Tire Pressure Monitoring System (TPMS) with Easy Fill Tire Alert and more. 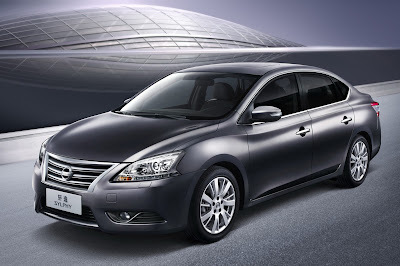 The 2013 Nissan Sentra is offered in a selection of well-equipped S, FE+ S, SV, FE+ SV, SR and SL trim levels. All models come with standard Xtronic CVT®, except the base Sentra S that is available with a choice of 6-speed manual or CVT. The NissanConnect with Navigation system, leather-appointed seats, heated front seats, rear disc brakes, power sliding glass moonroof and RearView Monitor are among the additional features available with the various equipment packages. "From front LED accents to rear LED taillights and every inch in between, the all-new 2013 Sentra serves notice to compact sedan buyers that the Nissan Sentra is stepping up in style and stepping up in desirability," said Castignetti. "In what has become one of the most competitive segments in the industry, Sentra is ready to take on all comers."